Location: South central Erie County, southwest of Springville. Starting from the intersection of Routes 219 and 39 head east and turn right (south) at the first intersection onto South Cascade Drive. Continue along South Cascade Drive for 2.4 miles passing under Route 219. Immediately after passing under the bridges for Route 219 turn right (north) onto Scoby Hill Road. Follow Scoby Hill Road for 0.9 of a mile to its end where there will be a small parking area for Scoby Dam Park. From the parking area you can follow a trail southwards for just over 0.1 of a mile to the dam. 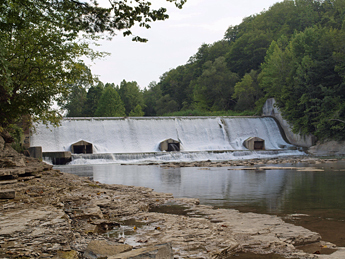 Scoby Dam is an mothballed hydroelectric dam on Cattaraugus Creek. Built in 1924 the dam is 30 feet in height and 182 feet in width. It supplied electricity to the Village of Springville from 1924 to 1996. The area became an Erie County park in April of 2001. 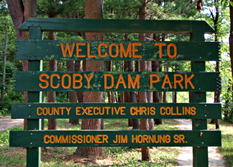 Scoby Dam Park is a strip of land along the bank of Cattaraugus Creek. 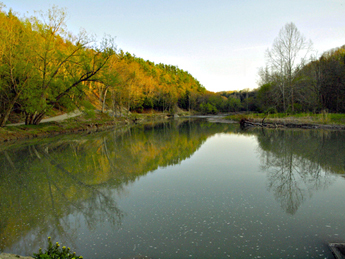 The park is a popular area for fishing and hiking to enjoy the scenery along the creek. Picnic tables are located north of the dam. The two white pillars on the left creek bank in the above photo are the remains of the power house for the original hydroelectric dam. This dam had a height of 20 feet and was built in 1898. The power house was destroyed the very day it was to be put in operation. It was redesigned, rebuilt and put into service in 1899. The power house for the original dam had three turbine water wheels. From the dam you may want to continue your hike along Cattaraugus Creek. The trail above the dam continues for 0.7 of a mile and ends under the bridges for Route 219. The trail is wide, easy to follow and affords scenic views of Cattaraugus Creek. To the left is a view of Cattaraugus Creek just above the Scoby Dam. The trail follows along the left bank of the creek. Roughly 0.4 of a mile past the dam the trail makes a turn to the southeast, following a gradual bend in Cattaraugus Creek. In a short distance the bridges for South Cascade Drive and Route 219 will come into view. The bridge for South Cascade Drive was built in 1954 originally for Route 219. It is a steel continuous truss bridge that is 652 feet in length. 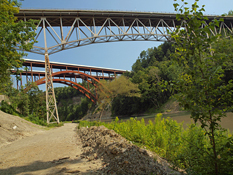 The bridge roadway is 165 feet above Cattaraugus Creek. 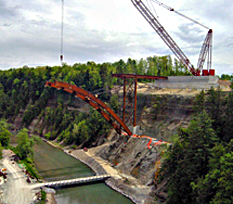 The photo to the left shows the north bound 219 bridge under construction on May 30, 2008. The two new bridges for Route 219 opened to traffic in late November of 2010. 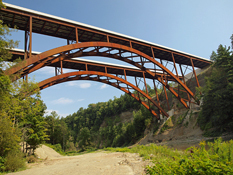 They are both steel arch bridges with a span of 705 feet. The roadway is 230 feet above the creek.